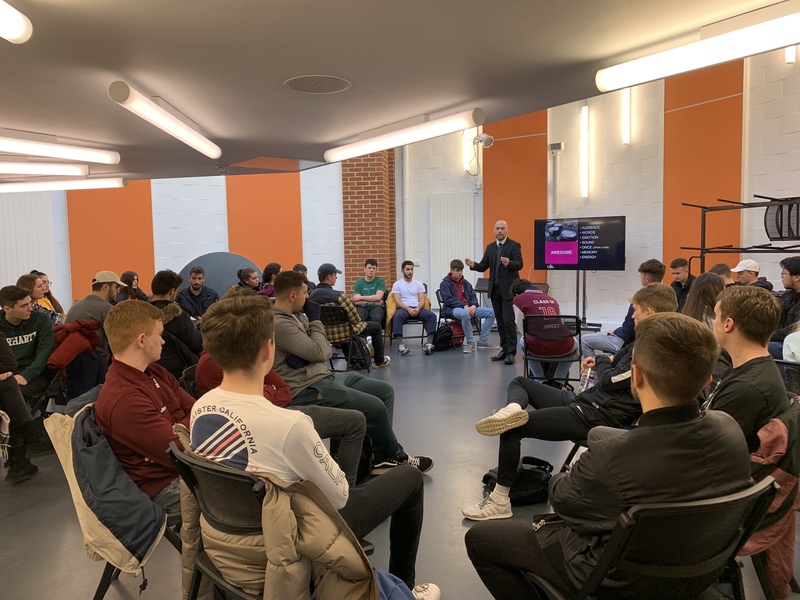 Last week, Phil Grant from the Chartered Management Institute (CMI) ran an amazing interactive workshop focusing on Pitch to IBM students. The workshop was based on an introductory lecture about Pitch in Week8, which was also held by the CMI. The workshop was specifically built this into the module to improve engagement, to develop the quality of presentations to be held in Weeks 11 and 12 and to help employability skills (communication/teamwork) and to give the students the opportunity to put into practice elements they are learning. The aim was to equip students with skills to help them with presentations on their business simulations in Week11/12. Phil conducted the workshop energetically and gave input in the Introduction to Business module which has around 569 students on it. One of the students who attended the workshop, Neysan Jones, 1st year Marketing and Management student, spoke about the workshop “Very different from usual workshops, and never done it like this before. More interactive”. When it comes to his favourite activity of the workshop, it was “Techniques of reducing the stress”, and he was describing it as “Useful. Techniques like reducing the stress could be used for any other situations as well other than presentations and would be applicable to other subjects/modules”. When he was asked about any suggestions and general opinions towards the workshop, he told us that it would be nice to have some external guest speakers for lectures/workshops, and would like to see something similar in the future as well. CMI is an accredited professional institution for management based in the United Kingdom. In addition to supporting its members, the organisation encourages management development, carries out research, produces a wide variety of publications on management interests, and publishes the official members’ magazine, Professional Manager. The Institute also engages with government and other public bodies concerning policy on management and business related issues. Professional Manager magazine is circulated to over 80,000 members of the CMI.